In the spring, the grubs had an entire fall and winter to strengthen up and become larger so they are much more difficult to kill. 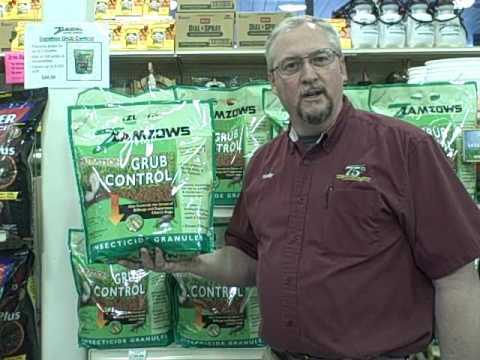 In the late summer to fall, the grubs are just barely starting to grow and they are much closer to the soil surface so they are easier to kill. Checking the soil for grubs is the only way to confirm that your lawn has grubs and determine if they are a problem. Make cuts 6 to 12 inches long and about 3 inches deep on three sides of a patch of grass. Peel back the turf and look for grubs. Check several areas and estimate the number of grubs per square foot in the lawn. Once you've finished checking for grubs, replace the turf. To check for grubs, cut a square of sod about 10 centimetres wide and lift it up. If you see five or more grubs, that's enough to warrant treatment with milky spore disease, beneficial nematodes or an insecticide containing imidicloprid (which won't kill beneficial earthworms).